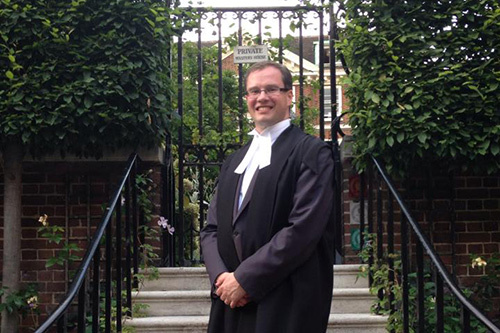 After completing two non-law degrees at the University of Cambridge, Howard embarked on his future career as a barrister by choosing the GDL at City. Why did you choose to study the GDL? I decided to study for the GDL as I wanted to become a barrister and did not have a law degree. As an undergraduate I studied Theology at the University of Cambridge before staying on to do postgraduate research in History. During this time I also did some undergraduate teaching. After Cambridge I worked as a teacher and as a researcher in Parliament. Why did you choose City, University of London? I chose City because of its outstanding reputation. Tell us about any mooting and pro bono work you took part in. During the GDL I competed in several mooting competitions. I was a Finalist in the City GDL Competition in the Supreme Court, a Semi-Finalist in the Inner Temple Lawson Moot and was on the City team that reached the Final of the national OUP/BPP Competition. The following year I was a member of the team that won the European Human Rights Moot Court Competition at the European Court of Human Rights. All four of us met at City on the GDL course and the experience we gained during that year helped enormously. All GDL students are encouraged to do pro bono work. I was, and still am, an active volunteer for the Free Representation Unit (FRU). FRU provides representation at Tribunals for clients who are not eligible for legal aid and who cannot afford to pay lawyers. I was called to the Bar by Inner Temple in July 2014. Since then I have been enjoying a gap-year before I start Pupillage in September 2015. This has involved various projects, including a traineeship at the European Court of Human Rights, moot coaching and judging at City, and pro bono work. I am also looking forward to doing some travelling. What advice or tips would you give to anyone who wants to study on the GDL? The GDL course involves a lot of hard work, but it is an intellectually stimulating and rewarding experience.